Judaism’s festival of Chanukah is one of the most easily recognizable holidays mentioned in Scripture. The signature eight-branched candlestick of the Chanukah menorah, known as the chanukkiyah, distinctly marks the celebration of the special time in the cold of winter. We remember the victory of the Jewish people in Israel long ago, and the rededication of the Temple for true worship to return in the land. The very word Chanukah literally means “Dedication.” In fact, next to Passover, it is probably the most popularly-observed of the festivals referred to in the Word. Given the prominent nature of the eight-day observance, it is yet a festival whose nature is admittedly somewhat odd. The strangeness is best seen in the fact that although it stems from significant events in Jewish history, events recorded in ancient texts, and most Jews today observe the holiday, the writings that record the historical events surrounding the festival are not a part of the Hebrew canon of Scripture. The first two books of the Maccabees, wherein are contained the accounts that resulted in the holiday of Chanukah, are instead viewed by Judaism as historical in nature, and remain to this day outside of the recognized inspired canon of the Hebrew Bible. The observance of the festival by Jewish people world-wide of this extra-biblical time is of striking note. In contrast to this oddity, the festival is distinctly mentioned in the Christian Scriptures of the New Testament (among Catholic, Orthodox, and Oriental Orthodox believers, Maccabees even holds a place as deuterocanonical in their canon), with the Messiah Yeshua Himself making effort to appear at the Temple during the festival, using the historical context of the time as a springboard to address His special authority from heaven, an event that is recorded for us in the book of John 10:22-42, and which ultimately led to not only many becoming angry with what His claims were hinting at, but also the gaining of many new followers for the Messiah. The strangeness here is that although Chanukah is shown as being observed in first-century Israel by the Jewish people, and even noted by the Messiah Yeshua Himself, on a whole Christians themselves do not observe this festival that is depicted in the New Testament. To put it succinctly, Jewish people observe a festival from Biblical times that is not distinctly mentioned in their Scriptures, while Christians do not observe a festival from Biblical times that is distinctly mentioned only in their Scriptures. What is going on here? Why did the Messiah in His earthly ministry, and the Jewish people to this day, recognize a festival that is not explicitly commanded in the Hebrew Scriptures? As believers who seek to obey our Creator’s Word, we must come to terms with this. It is my belief that the answer to why this unique festival has been recognized by Yeshua and His people for so long can be found by returning to the Scriptures themselves and paying careful attention to the information that is contained in its inspired words. It is my belief that Scripture will show that Chanukah, once properly understood, is actually a commandment from the Torah to be observed by believers in such a manner as they see fit. Such a statement is a huge one to make, I am well aware, but this study will endeavor to show the true nature of Chanukah, and in doing so, will validate my assertion as a legitimate claim based on the Word itself. Before we can understand and appreciate that, however, it is worth presenting the high points of the historical account of the events that culminated in the implementation of the festival of Chanukah. While the popular title of the text is Maccabees, the most ancient title given it was Sefer Beit Sar Benei El, meaning “Scroll of the House of the Chief Sons of God.” The text recounts events that led to great apostasy in the land of Israel, the invasion and subjugation of the true worship at the Temple, and the subsequent retaliation of the people, led by the priest Mattathias and his five sons – a retaliation that eventually saw victory against the invading Seleucid (Syrian-Greek) Empire. 12 And this proposal was agreeable to them. 13 So some from among the people eagerly went to the king, and he gave them authority to introduce the ordinances of the other nations. 14 So they built a school for naked athletics in Jerusalem according to the customs of the other nations. 15 And they made a fake foreskin for themselves, and abandoned the holy Covenant; and they joined themselves with the nations and sold themselves to act wickedly. 20 And after Antiochus had struck Egypt in the year 143, he returned and went up against Israel and went up against Jerusalem with a strong force. And the people in the city opened the gates to him, and he entered the city and took it, killing many Israelites. 23 and took away the silver and the gold and the precious vessels; he also took the hidden treasures which he found. 24 And having taken everything, he departed to his own land. And he committed murder, and he spoke with great arrogance. 42 each abandoning his particular customs. And all the nations conformed to the command of the king. 43 And many from Israel took delight in his religion, and they sacrificed to the idols and profaned the Sabbath. 49 so that they might forget the Torah and change all their observances. 51 Such were the accounts which he published throughout all his kingdom. And he appointed overseers over all the people, and he ordered the cities of Judah to offer sacrifices, city after city. 52 And many of the people, all those who abandoned the Torah, joined them and committed much evil in the land. 53 And Israel was driven into hiding, into every place of refuge which could be found. 54 And in the year 145, on the 25th day of the month Kislev, the king erected a horrible abomination upon the sacrificial-altar of burnt-offerings, and in the surrounding cities of Judah they built altars. 55 They also burnt incense at the doors of the houses and in the streets. 56 And any books of the Torah which they found they tore up and burned with fire. 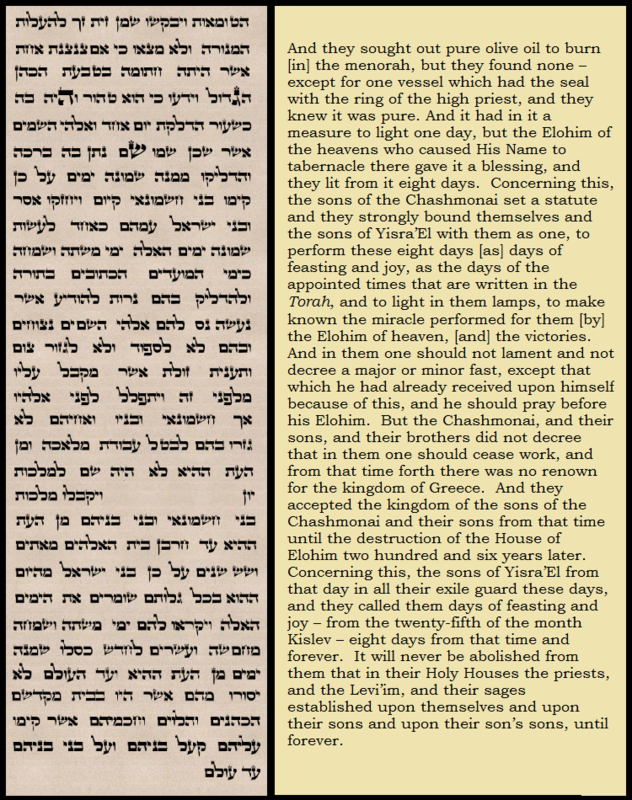 57 And whenever someone was found with a book of the Covenant, and if anyone observed the Torah, they were condemned to death by the king’s decree. 58 They kept using force against Israel, against those who were caught, and they led them away by force month after month, in the cities. 59 And on the twenty-fifth day of each month, they truly sacrificed on the altar which had been erected over the sacrificial-altar of burnt-offerings. 61 with the babies hung from their necks; and they also killed their families and plundered those who had circumcised them. The righteous of the land who were able fled from the astonishing evils in their midst, living in hiding from the wickedness of those who had chosen to follow the ways of the world. No real hope of stopping the tide of paganism existed until the astonishing rebellion of Mattathias, who was a Levitical priest unable to abide the request to participate in the apostasy of his country-folk. Not only did he refuse to participate, he went so far as to kill a fellow Jewish man who sought to sacrifice to the pagan idols right in front of all Israel. After this surprise stand being taken, Mattathias and his five sons began to engage in calculated attacks against the Seleucid authorities throughout the land of Israel, and all their confederates. While it might seem a shocking choice for priests to make, it was a righteous adhering to their ancient lineage from Aharon’s grandson, Phinehas, who was given the special eternal priesthood of battle known as “the priest anointed for war” [see my study: Anointed for War]. 1st Maccabees 2:54 makes the statement that the family of Mattathias was directly descended from the priest whose line would defend the Temple and go out to war with the armies of Israel. 43 And they cleansed the holy places, and they carried away the stones of the abomination and placed them into an unclean place. 44 And they took counsel on what should be done with the sacrificial-altar of burnt-offerings which had been profaned. 45 And the best counsel was to tear it down, lest it be a lasting shame to them that the nations had defiled it; so they tore down the sacrificial altar. 46 And they laid aside the stones in a requisite place in the House’s mountain, until a prophet should come to decide what to do about them. 47 Then they took uncut stones, according to the Torah, and built a new sacrificial-altar like the former one. 48 They also rebuilt the holy places and the interior of the House, and he consecrated the courts. 49 And they made new holy vessels of gold, and brought the lampstand, and the sacrificial-altar of incense, and the table into the inner-sanctum. 50 Then they burned incense on the sacrificial-altar, and kindled the lamps on the lampstand, and these illuminated the inner-sanctum. 51 They also put loaves on the table and hung up curtains. And this was how they finished all the work which they had undertaken. 53 they arose and offered sacrifice according to the Torah on the new sacrificial-altar of burnt-offerings which they had made. 54 And at the exact time of the month, on which the nations had profaned it, on that very day, it was consecrated with songs, and lutes, and harps, and cymbals. 55 And all the people fell on their faces, and bowed-down before G-d and blest into the heaven, which had prospered them. 56 So for eight days they celebrated the consecration of the sacrificial-altar and offered burnt-offerings with gladness and sacrifices of salvation and praise. 57 And they ornamented the forefront of the inner-sanctum with gold crowns and small-shields; and they repaired the gates and the priests’ chambers and furnished them with doors. 58 And there was great gladness among the people now that the reproach of the nations was removed. 59 Then Judah and his brothers and the entire assembly of Israel decreed that the days of the consecration of the sacrificial-altar should be observed with gladness and joy on the anniversary every year for eight days, from the 25th day of the month Kislev. This is the general overview of what transpired that resulted in the formation of the festival of Chanukah. There is much more information regarding the historical details that surrounded the account, and the interested reader can find it all in the first two books of Maccabees. Why would the writers tell us this information? 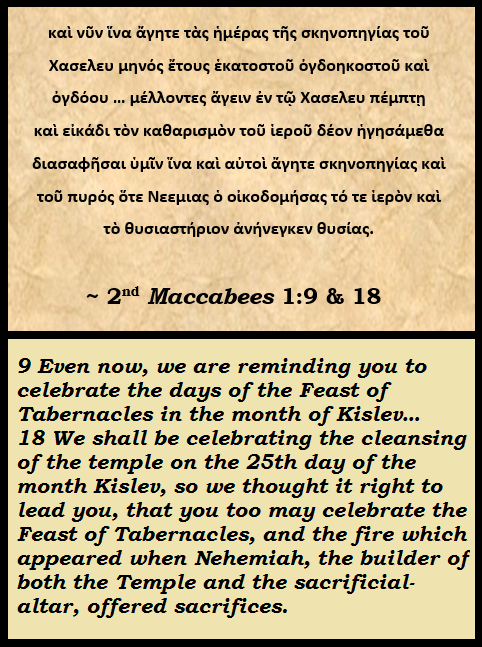 The feast of Tabernacles occurs during the seventh month, Tishri, not the ninth month of Kislev! The reason for this ultimately has to do with the dedication of the first Temple during the reign of King Solomon, which Scripture records for us in 1st Kings 8:63-66. 63 And Shelomoh sacrificed a sacrifice of peace-offerings, which he sacrificed to YHWH: oxen, twenty-two thousand, and sheep, one hundred and twenty thousand, and they dedicated the House of YHWH – the king and all the sons of Yisra’El. 64 On that day the king sanctified the midst of the court which was facing the House of YHWH, for he performed there the burnt-offering, and the meal-offering, and the fat of the peace-offerings, for the altar of bronze which faced YHWH was too small to receive the burnt-offering, and the meal-offering, and the fat of the peace-offerings. 65 And Shelomoh performed at that time the feast, and all Yisra’El with him, a great congregation, from the entrance of Khamath unto the river of Mitzrayim, before YHWH our Elohim, seven days and seven days – fourteen days! 66 On the eighth day he sent out the people, and they blessed the king, and they walked to their tents, rejoicing and of good heart concerning all the good which YHWH performed for David His servant, and for Yisra’El His people. This unprecedented holy event took place in the seventh month (8:2 tells us this brief detail), and the only seven-day feast in the seventh month is the Biblical feast of Tabernacles. The same account of the dedication of the Temple is repeated with some minor details of difference in the book of 2nd Chronicles 7:7-10. Therefore, based initially on this factor of how the first Temple was dedicated by the most famous king of Israel, the people of Judea at the time of the Maccabees, spurred by victory and the desire to show their religious devotion, decided to observe the rededication of the Temple in similar manner. The feast of Tabernacles was in this manner used as a template (no pun intended) on how to inaugurate anew their beloved Temple. Additional information concerning the dedication of the first Temple during the feast of Tabernacles is relevant to our topic, for we are told in the Mishnah, Sukkah 5:2-4, that at Tabernacles, the Temple was especially illuminated for the holy time. This special part of Tabernacles made the Temple a place that could be filled by worshipers even late into the night, long after the last of the sacrifices had been offered up. The addition of the extra menorahs in the courtyard made this possible, for the Talmud, tractate Sukkah 52b, tells us that the height of each of these festival menorahs was fifty cubits tall! In this detail of the dedication of the first Temple during Tabernacles, we can begin to see the formation of what later would become known as Chanukah, as it would utilize the ceremonial aspects of Tabernacles as the Scriptural basis for its particular rededication, thus taking on the special lighting ceremony, as well! ​18 “Do set your heart, from this day, and upward, from the twenty-fourth day of the ninth [month], from the day of the foundation of the Temple of YHWH, do set your heart! Here the text tells us that the Holy One declared the date for the inaugural dedicating of the second Temple began on the 24th of Kislev, the ninth month (Ezra 6:15-17 states the functional dedication was made a few month later in the month of Adar). It is thus no coincidence that the formal rededication of the second Temple as discussed in the book of Maccabees also occurred during essentially the exact same time, beginning rather with the 25th of Kislev! What we therefore can perceive in understanding these truths is that we invariably celebrate the dedication of the first Temple each year when we observe Tabernacles, for so the House was dedicated, and His Spirit came to dwell with us during that feast! Furthermore, we celebrate the dedication of the second Temple each year when we observe Chanukah! In the alignment of dates can be seen the guiding hand of the Most High. Here, the miracle is explained that the oil burned for eight days instead of just one, and that the desire of the priests was to institute a commemoration of the favor given to them by the Holy One through a yearly festival at this time that was reminiscent of the ones commanded by the Spirit in the Torah. Here is the second ancient historical account of the miracle of the oil burning beyond its normal physical allowance. Only one container of olive oil remained untouched from the invasive desecrations of the wicked Seleucids, and although it was insufficient to keep the menorah lit for the time it would take to finish the necessary cleansings of the Temple to resume worship, the Talmud tells us that it miraculously did last long enough for just that to happen! In fact, in the Otzar Midrashim L’Chanukah, the view is stated in that text that the single untouched vessel of oil was not found until the defiled altar was taken apart and removed from the Temple, as the book of 1st Maccabees 4:44-48 states occurred. The tradition is that a wise priest, before the altar was desecrated, reached into the crawl-space between the ramp and the altar that led into the subterranean cavity (called SHISSIN) where the wine and oil libations descended when they were poured into their receptacles atop the altar, and in that hidden access-point he secreted away a single vessel of sealed oil. [see my study: The Bleeding Temple for the overlooked physical and spiritual importance of this underground channel below the Temple]. If this ancient tradition concerning the preservation of the vessel of holy oil is indeed accurate, and it does ring with far more likelihood than the other much later proposed options, it would make for an interesting nature to be assumed for the oil that was found and used. Consider: anything offered on the altar is to be viewed as a sacrifice to the Holy One. Olive oil is one of the allowed substances in Torah to be offered on the altar. The location of the cavity in the altar still technically met the requirements of an offering being on the altar, but the result was different with this vessel of oil. Normally, oil offered on the altar drained down into the subterranean cavity, and was disposed of through natural processes in the depths under the Temple. In this case, the oil was preserved in its container, yet it being placed at the altar legally relegated it to the status of an offering that was never actually consumed by the altar! The Talmudic account that the menorah’s fires burned for an abnormal amount of time from the use of such oil would point to the unique sacrificial nature bestowed upon it. It was intended for the menorah, but instead went to the altar, where its sanctity underwent a change, and so in the return for use for the menorah, it is as if something was owed the Holy One by its use. The extension of light from it could be proposed as the Holy One taking what fire should have been His at the altar. While this might sound like an odd thing to suggest, there is precedent for it in the Scriptures. 18 And an angel of YHWH said to Gad to say to David that David should go up, and set an altar to YHWH at the threshing-floor of Arnan the Yevusi. 26 And David built there an altar to YHWH, and lifted up burnt-offerings and peace-offerings, and called unto YHWH, and He replied to him with fire from the heavens over the altar of burnt-offering. The dedication of the site was blessed by a miraculous event of fire! The site of the first Temple was inaugurated immediately by the acceptance of the Holy One with the presence of a flame that was not expected! Likewise, when the dream of King David was made reality, and his son Solomon built and dedicated the Temple on those very grounds, we see a similar event unfold, as recorded in the book of 2nd Chronicles 7:1. ​And at the conclusion of Shelomoh’s praying, then the fire descended from the heavens, and consumed the burnt-offering and the sacrifices, and the glory of YHWH filled the House. Once more, at the dedication of the first Temple, a miraculous event of flame occurred in the midst of the people! The inauguration of the Temple for worship included a miracle of lighting the altar! In this we see a pattern developing of miraculous fire during the times of dedication of His Holy House. Furthermore, although not a detail mentioned in Scripture at the rededication of the second Temple in Ezra chapter 6, we do read of a miraculous event of fire lighting the altar of that restored House in the book of 2nd Maccabees 1:21-22, which was begun to be referenced back in 1:18, previously. We therefore have references that mention a miraculous fire at the dedication of the threshing-floor where the Temple would be built, as well as a miraculous fire at the same place when the Temple was built, a miraculous fire at yet again the same place when the Temple was rebuilt, and a miraculous fire once more when the second Temple was rededicated. The repeated event makes complete sense when we understand that it was symbolic of the acceptance of the Most High for true worship to begin in that place. When we see the festival of Chanukah from this perspective, it helps us to appreciate exactly what was happening with the dedication and the miracle of the menorah burning oil that should not have lasted so long. For some reason, the event of dedication of the Holy House involved repeatedly miracles of fire. The theme is consistent from Biblical to deuterocanonical sources. But just what is it about Chanukah / dedication that is so important to the Holy One? The answer to this question will make it all fall into place, I truly believe. Everything should come full circle as we begin to bring this involved study to a close. The act of dedication is not something that Solomon thought up when he finished building the first Temple. Neither was it merely a “good idea” the priests came up with after the defeat of the Seleucid invaders that led to Chanukah in the second Temple. Rather, it is a holy and spiritual act. Chanukah / dedication is, in all truth, a binding commandment of the Torah! If this sounds odd to even consider, then let us turn to the Torah and see for ourselves the commandment of dedication given to His people to obey. This passage is the first time in all of Torah that we see the word that explicitly references the concept behind Chanukah. While the term appears as the basis for the name Enoch (Khanok in Hebrew pronunciation) in Genesis, it is used only as a name in that respect, and does not factor into the performance of a thing. As a verb, we see it appear in the Torah here in this specific commandment. The Torah requires us to Chanukah a house that is built. The binding nature of dedication should be strikingly evident. The need for a house to be dedicated, to experience its own Chanukah, so to speak, is vital. The act of dedication devotes a thing to something else. In this case, dedication of a house devotes it to the Holy One. The Most High sees the need for a home to be dedicated as taking top priority, eclipsing even the looming threat of national war. Even in the face of battle, dedication must take place! It is this factor that does not need to be passed over. The Torah’s commandment to dedicate a house and the importance of doing so, even at the moment of war, directly involves the account of Chanukah. This is shown in two different places in the historical document of 1st Maccabees. The initial incident is in 1st Maccabees 3:55-56, during the campaign against the influences of King Antiochus IV. The small band of Jewish resistance fighters were in dire need of every soldier available, yet Judah knew the entire conflict was about people disobeying the Torah, and the endeavor to restore observance of it throughout the land, and so he made certain that even this commandment from Deuteronomy chapter 20 to dedicate one’s house was observed, even at the cost of losing vital fighters. The second incident is even more telling. We see that after the Temple is retaken by the Maccabean effort, the battle is put on hold and the Holy House undergoes rededication from the pagan usurpation. Only then does the war with the surrounding enemies of Israel resume (see 1st Maccabees chapter 5). The sons of Mattathias, priests of truth, knew that dedicating the Temple took precedence over the fight, and so they ceased their assault against the idolaters to properly inaugurate the Holy House, and when that was done, engaged once more in eradicating those who sought to destroy the enjoyment of their victories. It is important to note that how this dedication of the Temple is to be performed is not laid out for us specifically in the Torah. The commandment is to do it, but the ways in which it is to be done are not commanded. This study has shown in its various quoted works that different methods were used at different times. The book of Numbers 7:10-89 is a lengthy passage that lists the multitude of ways the tribal leaders of Israel participated in dedicating the Tabernacle of Meeting, which was the prototype for the Temple that would be built several hundred years later. While what was brought is listed in detail, no commandment exists in Torah as to what needed to be brought to do so. The dedication was from the heart of the people. What is of interest, however, is the nature of the commandment that immediately followed the dedication of the Tabernacle of Meeting: Numbers 8:1-3 tells us what was commanded to be done right after all the tribal dedicatory offerings were brought. 3 And Aharon did so: over the face of the lampstand he burned the lamps, as YHWH commanded Mosheh. It should not be downplayed that right after the dedicatory offerings were given, the menorah was commanded to be lit to give light on the day of Chanukah in the Tabernacle! While there was leniency in what was brought on the first Chanukah of the Holy Place, there was also the direct command for the menorah to give light on that very day, too. The spreading of light via the menorah is a commandment regarding the act of dedication, while other methods are left up to the worshiper. In this, then, lay a degree of freedom. This freedom can also be seen in that King David himself, who is responsible for writing the lengthy Psalm 119 about his love for the Torah, also devoted an entire song just for the dedication / Chanukah of his own house, and it can be read in its entirety in Psalm 30. Thus, we see that he found that a song was a fitting manner to mark the dedication of his home. We can take also in this context the example of Jacob, who, when he understood the importance of the spiritual experience he had at Bethel, is said to have done something interesting in Genesis 28:17-18. 18 And Ya’aqov rose in the morning, and took the stone which was there at his head, and set it as a pillar, and poured oil over its head. Again, we see the presence of oil at a dedication - that of Bethel by the act of Jacob, which literally means “House of the Deity.” He is the first person recorded in Scripture ever anointing anything with oil, and the first time it is mentioned is in regards to him experiencing a closeness to the Holy One and viewing the site as the House of his Deity. We cannot ignore this important context. Jacob’s example aligns with the oil used for the dedication of the Temple and the miracle of the oil that occurred during the rededication of the second Temple. It would seem the examples of those in Scripture on how dedication of a house / House should be done agree, at least: the use of oil to devote a place to Him! The concept of a place being dedicated probably finds its most outstanding nature in the story of Moses. In Exodus 3:1-5, the text tells of the first encounter Moses had with the Spirit of the Holy One. 1 And Mosheh was shepherding the flock of Yitro his father-in-law, priest of Midyan, and he drove the flock [to] the back of the wilderness, and came to the Mountain of Elohim, Khoreyv. 2 And the angel of YHWH appeared to him in a flame of fire from the middle of a bush. And he peered, and behold! the bush burned in the fire, yet the bush was not consumed! This passage records the initial meeting of Moses and the Most High, and it does so with a place that is sanctified, and with a bush that is ignited in a flame that is not consuming it! The miraculous light here burned but did not consume what lit it, just like we read of the menorah’s wicks burning the oil but not consuming it at the festival of Chanukah! The parallel extends further in that the menorah itself is a golden representation of an almond tree, as the intricate details of its construction show it to be in Exodus 25:31-40. This factor places a direct link to the burning bush and the golden menorah – which is commanded to built in such a way as to appear to be a bush that is “on fire,” yet never consumed! A very likely four-month allowance for the plague timeframe, added to about a month’s journey across the Sinai, and we arrive at the month of Kislev for when Moses encountered the Most High and the burning bush – precisely at the time when Chanukah would later occur! The parallel themes of a dedicated holy place, as well as miraculously-burning light, and a plant afire but not consumed make for quite a solid connection. One final, rather strange link in this passage is found in the Hebrew text of Exodus 3:4, when the text says: KI SAR LIR’OT VAYIQRA “that he wandered over to see, then called,” there is a unique arrangement of letters that further points to the time of Kislev and this event. If one were to take the first letter of each of the four words of that segment of the text, and arrange them as they are encountered as a word, then the result becomes KISLEV! Interestingly, this is the only time in the entire flow of Hebrew text in the Torah that those letters are arranged in such a manner, which makes it at least worth mentioning. In this study to see these embedded links, we can go back even further, if we dare. Back to the creation event, back to the first week of the world! The earth was made to be a home for the Spirit of the Creator, where He could dwell in the midst of man without anything separating. The entire world, made without sin, was holy and effectively the House of the Most High. Other than a lack of sin in the world, was there anything that could be pointed to in the creation event that would suggest a dedication of the earth? I believe the answer is yes, and not only can be found in the Word itself, but aligns seamlessly with the context of Chanukah that has lit the way through this study. The book of Isaiah 30:26 contains the information that factors into this matter significantly. And the light of the moon will be as the light of the sun, and the light of the sun shall be sevenfold, as light of the seven days, on the day YHWH binds the breaking of His people, and heals the blow of their wound. Pay attention to the above verse. In fact, you may want to reread it. I have attempted to render a detail into English that is contained in the Hebrew, but is seldom, if ever, translated intact into English versions. The Hebrew phrase is K’OR SHIVAT HAYAMIM “as light of the seven days.” It is not “light of seven days,” but literally, “light of the seven days,” implying a period of time expected to be understood by the reader as specific. There is only one “light of the seven days” that this could be explicitly referring to, given the date of the prophet’s writing, and that is the unique light during the creation week! The Holy One wrought light into the universe with His voice, and it preceded all other physical sources of light. There was no physical reason for that primordial light to burn – it did so through a means miraculous to us! By that light He created all that we know and experience. For seven days His special light shone into the creation, like a menorah burning in the Temple with unnatural power at Chanukah. One might be quick to point out that the menorah is said to have been lit at Chanukah for eight days, and not seven, so that the parallel is not as smooth as we might expect. However, it must be remembered at Chanukah that the light of the first day’s oil was not miraculous. It burned that first day just as everyone expected it to burn and give light. It was the following seven days’ worth of light that came from the oil which was truly miraculous, and so the parallel is indeed maintained. The special sevenfold light of creation served as a dedication of the world to Him. Yes, man would quickly defile the sanctuary of earth by his idolatry, but the Most High knew how to rededicate the soiled holy ground. With the coming of the Messiah, who exclaimed in truth to be the Light of the world, we see the earthly temple in the process of restoration and rededication. John 8:12 takes on special meaning when understood Yeshua said it on the last great day of the feast of Tabernacles [see 7:2 & 37], which would have been in the presence of the brilliant golden menorahs that burned high in the Temple courtyard. 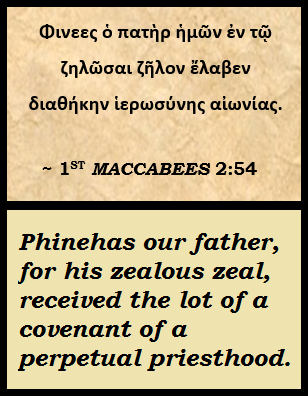 The Aramaic of the Peshitta New Testament has Yeshua making this statement on the last great day of Tabernacles, but the Greek of the Protestant canon gives a detail that requires it to have been the day afterwards, which would have made Yeshua’s statement one day late, and of far less impact. Personally, I would suggest the alignment of the Aramaic text’s information with the date of Tabernacles seems most accurate contextually and historically. In fact, although the birth of Yeshua is widely celebrated during the winter season with the Christian celebration of Christmas, sometimes seen even overlapping with the 25th of the ninth month of Kislev and the observance of Chanukah, due to the slightly moving nature of the Hebrew calendar, a careful study of the Word will yield the truth that His birth actually happened at the feast of Tabernacles in the seventh Scriptural month. A simple count backwards of ten months for gestation in the womb of Mary, and it puts the conception of Yeshua the Messiah in the month of Kislev! [see my study: A Tabernacles Nativity] Thus, we have the Messiah’s birth at the time of the dedication of the first Temple during Tabernacles, and His conception at the time of the dedication and rededication of the second Temple during Chanukah! It makes perfect sense when we understand this timing of events and how He associated the Temple itself with His own body (see John 2:19) – His conception and birth were aligned to the Chanukah / dedication events that occurred for both Temples! This Messianic link to Chanukah is best understood when we take the text of John 10:22-36 into account. Yeshua used that time which we see would have aligned with His divine conception to speak to His special authority in the earth and connection to the Father. He knew Chanukah would be celebrated at the Temple during that time, and made it a point to make an appearance in His Father’s House in verses 22-23. ​22 Yet it was the Feast of Dedication in Urishlem, and it was winter. 23 And Yeshua was walking in the Temple, in the Porch of Shlemun. In other words, those doing righteousness will follow the Righteous One. There is a spiritual war taking place, and the forces of evil are vying for the hearts of the Covenant-people. The link is obvious in His words and the recorded words of Mattathias. The historical import of this statement, however, was quickly overshadowed by the loaded declaration He made and the subsequent discussion He had with those present, recorded in John 10:30-36. 31 And again, the Yihudaye took up rocks to stone Him. The claims of Yeshua here went straight to the heart of the Chanukah issue for His Jewish countrymen. A huge factor in the Chanukah historical account was that of King Antiochus IV, who was worshipped as deity, viewed by his idolatrous followers as a man who was divine. The declaration of Yeshua at this point in the Temple at Chanukah, stating in no uncertain terms that He was the Son of Deity, directly spoke to that false view of King Antiochus IV about two centuries prior. Those who heard were astounded that He would dare make this bold utterance in the context of the festival. The fact that He waited until Chanukah, the time of His own uniquely divine conception, to make this statement, also speaks volumes as to how He viewed the holy memorial of the rededication of true worship. In all of this we see the Messianic hope foundational in the time of Chanukah – the dedication and rededication of the Temple. Messiah is the ultimate goal of all these things – the ideal is there for which Mattathias and his sons fought, which is man being able to abide once more in the Presence of the Holy One, accepting our worship of Him as pure and undefiled. There are no coincidences in the creation of the Most High. These profound alignments and repeated events of miracles of fire show the hand of the Spirit guiding the acts of His people, pushing them ever onward, preserving a Holy Place wherein the Messiah, the true Light of the world, would be able to worship, minister, send His fellow countrymen to likewise fulfill the Torah as it pertained to their situations, and where He would one day send the Holy Spirit to dwell upon His students and those who believed in His purpose. When we properly understand the unique background of Chanukah and the Torah’s mandate of the commandment to dedicate the Holy House, then we can appreciate the victories and the miracle of Chanukah with a spirit devoted to the One who desires to dwell in our midst all year long. For a detailed rebuttal of the unfounded assertion that the traditional observances of Chanukah were borrowed from the pagan festival of Saturnalia, see my reply in the F.A.Q.s section, where actual historical references are cited to prove the lack of evidence that any idolatrous bearing was had upon the observances of the prophetic time of Chanukah.